One of the most frequently asked questions from fashion executives was when and how to migrate from SAP Fashion Management (FMS) to SAP S/4HANA for Fashion. Nearly every retailer has a different starting point. Some have multiple ERP systems such as AFS or IS-Retail. Some have already implemented SAP FMS or in the middle of an implementation. 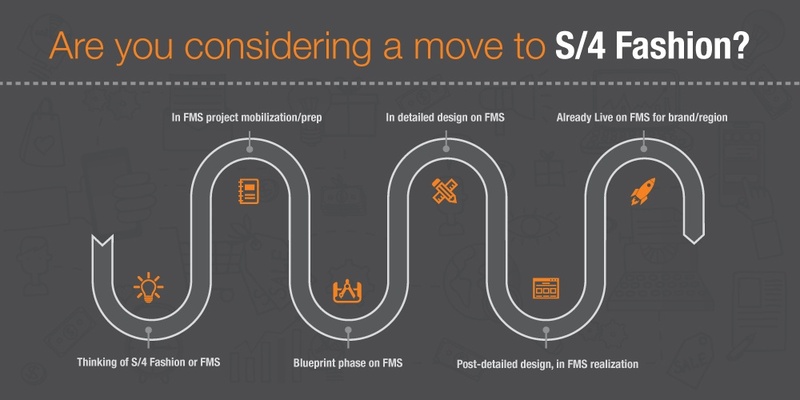 Some are thinking of moving to SAP FMS but are unclear whether they should wait for the release of S/4 Fashion. Consequently, we addressed different implementation scenarios (a sample pictured below), depending on your existing ERP or which stage of the SAP FMS transformation you're in. Should retailers wait for S/4HANA Fashion before implementing SAP Fashion Management? There are multiple factors to consider prior to moving to S/4HANA Fashion such as maturity of the solution, business need/urgency, functionality gain/loss, migration effort and licensing implications. It is important to note that the move to S/4 HANA from FMS is not considered as a new ERP implementation and that companies on a single global instance of SAP ERP such as SAP Fashion Management are actually better positioned to making the move to S/4HANA Fashion. This is partly due to already addresssing standardization in master data and business processes. Such companies also have the option of migrating to S/4 HANA to just a single area of their business and expanding from there. However, standardizing on a single ERP instance is not a prerequisite for adopting SAP S/4 HANA for Fashion. Our evaluation checklist will help recommend your next step - depending on the scope, objectives and requirements. Looking for advice on when, why or how to move to SAP S/4HANA for Fashion, or are ready now to start an S/4HANA engagement? The attune S/4HANA Fashion Impact Assessment and Demo helps to answer your questions. What can Fashion companies do if they're already implementing or have implemented SAP Fashion Managerment (FMS)? For fashion companies who are implementing or have gone live on SAP FMS, the announcement of S/4 Fashion has caused confusion on deciding the next best step. 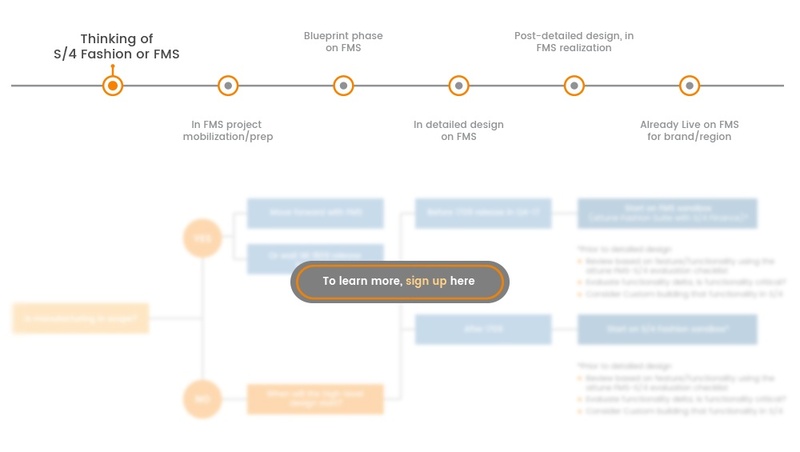 Leveraging our in-depth expertise of the solution, we've mapped out several paths from FMS to S/4HANA Fashion - depending on which stage of the implementation you're in - whether you're in project mobilization, in the realization stage or live on FMS. To access to the slide deck, sign up here. Why should CIOs consider migrating to S/4 Fashion? There still remains a degree of ambiguity over what S/4 Fashion brings to the table for fashion companies. SAP’s first industry solution for the fashion sector developed natively on the SAP HANA platform, S/4HANA Fashion places SAP Fashion Management on a S/4HANA environment. It is expected to help retailers simultaneously view and manage retail, wholesale and manufacturing channels, control inventory requirements more easily and effectively, analyze and direct where and how products are stocked and accelerate time-to-value to enable a customer-centric business. The suite is designed to process massive amounts of data much faster than legacy ERP systems, and greatly streamlines the steps required to execute various business processes. The user interface, which can be personalized, is more modern and intuitive. Additionally, it funnels insights into operational data, empowering retailers with contextual, real-time information for faster and better decision making. For example, reports on profit by product in legacy systems are only available at month end and is done periodically due to the time taken to gather the data. However, with SAP S/4 Fashion, the data resides in memory which means retail executives are able to access this information in minutes. The speed at which this occurs presents a competitive advantage, allowing companies to respond to consumers with offers and promotions much more quickly than they could in the past. Furthermore, it provides a simplified data model designed to help CIOs reduce their companies’ data footprints and associated hardware, maintenance, and labor costs. Got questions about making a move to SAP S/4 HANA? Let us know in the comments section below or sign up for a personalized session to help guide you through the decision making process.